Oro Governor, Gary Juffa has called for a more concerted effort from government agencies and the country’s disciplined forces towards a more comprehensive search for the five missing PNG Institute of Medical Research scientists who vanished off the coast of the West New Britain Province on August 1 last year. Mr Juffa was concerned that the mystery of their disappearance has remained unsolved for over a year, adding that the families of the missing scientists and the country needed to have closure on the issue. “I am preparing notices of concern to be distributed to the relevant Ministers and proposing that a concerted effort be made by the disciplined forces to search for these missing sons and daughters of Papua New Guinea and bring the matter to closure. “Millions are spent on (commissions of) inquiries that go nowhere. Millions are squandered on so called consultations and feasibility studies that result in nothing but wastage of funds. I am asking that some money be allocated for an operation to be mounted to thoroughly investigate this case and bring about closure,” Mr Juffa said. In a report carried by the Post Courier in February this year, families of the five missing scientists had called on government authorities to accord them the same concern given to victims of the MV Rabaul Queen sinking, however to date, no new development has been reported. The malaria scientists from the Goroka based PNGIMR are team leader Gideon Gibson, George Dagoya, Lydia Petrus, Leonard Vavana, and Tania Oakiva. They and their two boat crewmen and another passenger had left Milimata on mainland Kove for the outer Bali Islands. Only their boat has been re-discovered in faraway Koil Island, East Sepik Province, devoid of its passengers and cargo. 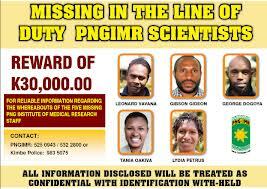 The PNGIMR has since posted a K30,000 reward for information leading to the discovery of the missing five.